Last night I completed the first of my “Earth Hour” assignment images. 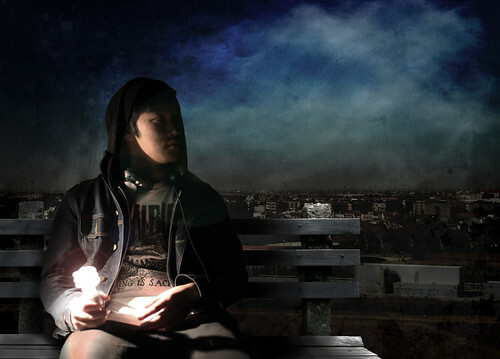 It’s a composite image that uses a studio portrait originally shot against a neutral background with two Creative Commons licensed (royalty free) images. It is the most critical of my assignment images, as it may turn out to be the only one I do with a “lit” bulb in it, and therefore the critical image to contrast with all of the other images I produce (which will probably feature attractively portrayed people holding unlit bulbs). Click the image to go through to its Flickr page to view it in high resolution. I’ve placed the subject off-center in accordance with the Rule of Thirds, balanced by the background light in the opposite third quadrant. The subject is looking into the middle of the image which looks more correct than if he were on the right of the image looking out of it. The grey park bench adds to the feeling of urban starkness, which carries into the bleak cityscape in the background. Lighting: Low-light shot: could only use a single light to give the effect that the light bulb in the hand was the only light source in the image foreground. 1x Tungsten studio light with snoot from left of camera directed onto bulb. Intentionally no fill light on right as a harshly lit effect was desired. ~ by Q on June 4, 2009.